The Natalia Mustangs stumbled in their District 30-3A opener last Friday night in Frio County. The Wolves did a great job of protecting their home court, as their offensive game plan kept the Stangs on their toes the entire night. Despite opening the game with a great first quarter, Dilley was able to turn up the heat in the 2nd quarter, outscoring the Stangs 17-11 which fueled them to a lop-sided 68-39 victory over Natalia. As mentioned, things were close in the opening quarter, as Jared Stallworth knocked down a pair of baskets to lead Natalia to an 8-point quarter. This resulted in a 10-8 deficit after one. Despite being outscored in the 2nd quarter as mentioned above, there was improvement on the offensive end of things. Matt Contreras knocked down a 3-pointer and a pair of free throws, as Daniel Ramirez added two buckets from inside. Dilley took a 27-19 lead into the half as #35 for the Wolves had scored 12 of the 27 first half points. In the second half, Dilley began to pull away from Natalia for good, as they out-scored the Stangs 17-9 in the 3rd quarter allowing for a 44-28 lead going into the 4th. The Stangs had their best offensive quarter, as six players combined for a 12 point effort. In the end it was not enough, because Natalia had their worst defensive quarter giving up 24 to Dilley resulting in the 68-39 lop-sided loss. Natalia did not have a player reach double digit scoring offensively, but did have a total of seven contribute. Scoring Leaders– Gutierrez 8, Ramirez 8, Armendariz 7, Contreras 7, Stallworth 6. It was a low scoring defensive battle last week in Dimmit County as the Natalia Mustangs battled the Carrizo Springs Wildcats. Matt Contreras was the lone Mustang to finish in double digit scoring as he produced an 11-point effort in a 41-30 road loss. The Mustangs were able to edge the Cats in scoring in the opening quarter 7-5. Fabian Ruiz led with a pair of buckets, as Contreras knocked down a 3-pointer accounting for the offensive effort. In the second quarter, Carrizo Springs worked the ball around, as five players combined for a 13 point effort en route to an 18-11 lead at the half over Natalia. Ruiz along with Jared Stallworth both pitched in buckets in the quarter. 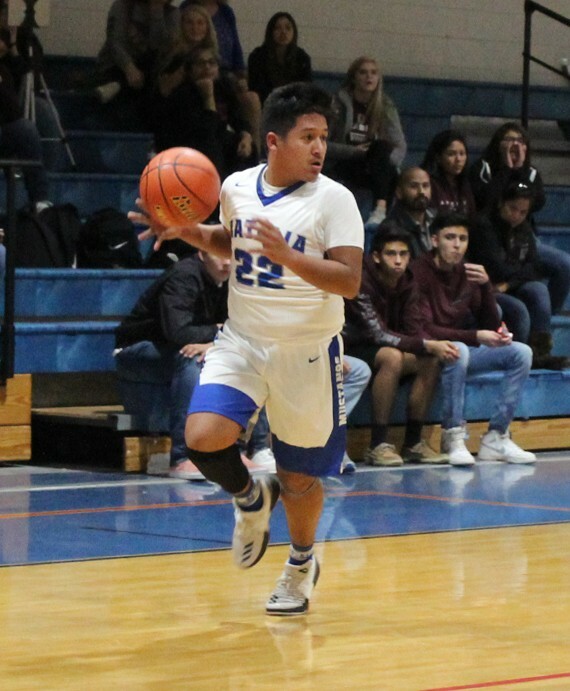 In the second half, Natalia came out and played a better offensive quarter, as Julian Armendariz, Contreras, Ruiz and Daniel Ramirez combined for an 11-point effort. Unfortunately, Carrizo was one point better, resulting in a 30-22 lead going into the 4th quarter of play. Natalia and Carrizo Springs played to an even 8-point effort in the 4th resulting in a 41-30 victory for the Cats. Contreras led efforts in the 4th scoring five of the eight points. “We came out and played well in the 2nd half and had cut the deficit to six with about three minutes to go, but couldn’t get any stops on the defensive end,” Welsh said. “Although we came up short, I feel like we played with confidence and we will need that in district play. Scoring Leaders – Contreras 11, Armendariz 7, Ruiz 7, Ramirez 3, Stallworth 2. District favorite Lytle was in town on press night for what was expected to be a very tough opponent for the Mustangs. This Friday, January 18th Natalia travels to Atascosa County for yet another tough challenge versus the J-Town Indians. The Varsity game is set for 7:45 p.m.
On Tuesday, January 22nd the Mustangs travel to LaSalle County to face the Cotulla Cowboys on the road at 7:45 p.m.